Join the Network that Gives the Most! Move to Banglalink’s network anytime without changing your current mobile number through Mobile Number Portability (MNP). Through this you can change your network service provider to another operator without changing your current mobile number. Why would you join the network that gives the most? Banglalink is ready for you with the highest spectrum and best customer service among all the mobile operators. And the festivities of giving the most is on always. To indulge in the festivities join us using MNP. *Call rate validity on recharge is 3 months (i.e. 90 days) and Free 1GB Internet’s validity is 15 days. *New connections will get Pre-loaded Tk. 5 balance, valid for 15 days and can be used for any Banglalink service. To check main account balance, dial *124#. *50 MB bonus internet is valid for 3 days. To check your internet balance dial *124*5#. *50 bonus BL-BL SMS is valid for 10 days. To check your SMS balance, dial *124*4#. *22 paisa/10 second call rate is applicable to all numbers through 24 hours. What documents you’ll have to bring for MNP? What action steps are needed before activating MNP? How often can I activate MNP? Is there any stay time or condition of MNP? *You can transfer (port) your mobile phone number as many times as you like. However, there is a 90 day stay period after a MNP process before another MNP request can be made. Will I be required to change my SIM card after successfully porting to the new Mobile Service provider? 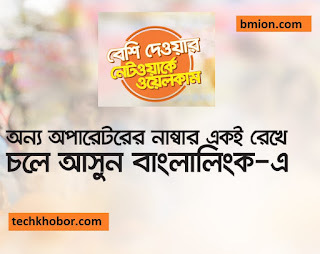 -Yes, due to the unique features offered by each Mobile Service provider, you will be provided a new Banglalink SIM card after successful MNP. What is the transfer time for a consumer? -Almost instantly in working days. However, it may take maximum 72 hours if there is any issue. Will there be any disruption to my service during the transfer (porting) process? - MNP process will be completed almost instantly. However, there may likely be a 2-4 hours disruption to your mobile phone service during the porting process. -Your bill cycle for Postpaid connection may be changed with your new service provider. However, you can change the cycle based on your requirement later. Will my air time money, unused data/minute/SMS etc. be carry forwarded to after porting out? -No. Un-used prepaid balance, data/minute/SMS etc. of the ported-out number will not be carry forwarded. Will I be able to enjoy the similar services, like VAS, roaming facility etc. as I have been enjoying with my existing Mobile Service provider after Porting? -Yes, but Value Added Services may differ from your current Mobile service provider to another Mobile Service provider. You need to register yourself again with the Value Added Services, you want to subscribe, after successful porting to the new Mobile Service provider. Will my contacts, address book etc. remain intact after successful MNP? -The contacts saved in the phone, yes, will remain intact. However, if they are saved in the SIM card, they will not remain intact as you will get a new SIM card from your new Mobile Service provider. Therefore, it is advised to copy your contacts from SIM to the phone before porting. Can I transfer (port) my pre-paid mobile phone number to a post-paid mobile or vice versa? Who is a donor operator? -Donor Operator means the Service provider; to whose network the mobile number belongs at the time the subscriber makes a request for porting. Who is a recipient operator? -Recipient Operator means the Service Provider who will be providing mobile telecommunication service to the subscriber after porting. How do I check balance, buy data, use customer service etc?